If you're using the Calxa Online browser app, refer to step 7. in this article instead. 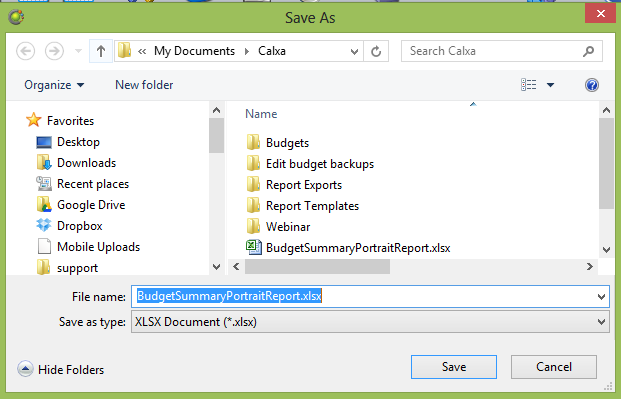 When viewing reports on the Calxa screen, you can choose to export and save your report in various formats. 1. To begin, you will need to run a report. For assistance with running report please review the help note Running Reports. 2. Whilst viewing reports, you will notice on the reports menu there is a button called Export Document. 3. Click the button outlined above to export a report in the default PDF format. a. To export a report in a different format, click the drop down arrow to the right of this icon. Note: For details of each format see the Report Format Section below. b. Clicking Send via Email will allow you to export and attach the report to a new email during the same process. 4. Update the export options and click OK.
5. Now provide a file name and location to save the exported report then click Save. 6. Click Yes to open the exported report. PDF File (Portable Document Format) – A file format that is used to present documents in a manner independent of application software, hardware, and operating systems. PDF files will open on any computer or device that has a PDF Reader. HTML File (Hypertext Markup Language) - A format used as the basis of a web page. The exported file will be opened by your default web browser application. MHT File (short for MIME HTML) – Similar to the HTML format this will be opened by your default web browser however images will be imbedded into the document as opposed to saved separately. RTF File (Rich Text Format) - A text file format used by Microsoft products, such as Word and Office and is readable by most word processors. XLS File (eXceL Spreadsheet) – A file extension for a spreadsheet file format created by Microsoft for use with Microsoft Excel versions 2003 and earlier. 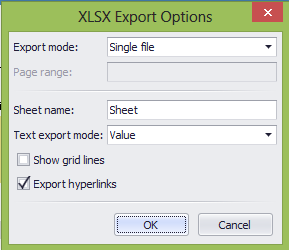 XLSX File – A file extension for an open XML spreadsheet file format used by Microsoft Excel versions 2007 or higher. CSV File (Comma-Separated Values) – A file that stores tabular data (numbers and text) in plain text form. Text File – Similar to the CSV format, it saves in Plain text where values are separated by Tabs. Image File - The report will be saved as a digital image format. There are a number of formats to choose from including JPEG and PNG.